Thinking about getting your extended family or friends together for a Key West vacation? 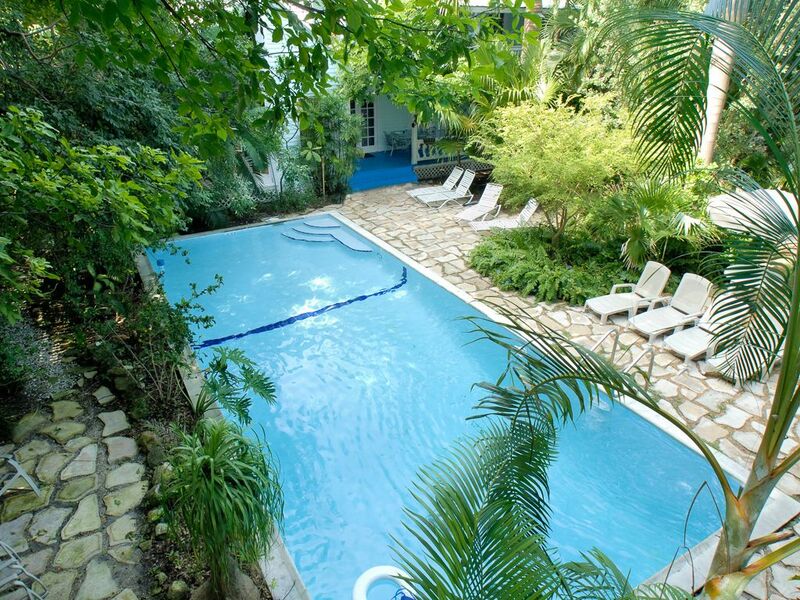 This one-of-kind gated Key West vacation rental compound, with large private swimming pool in spacious tropical garden setting, could be the perfect place. A special feature of this private 'mini-compound' property is the large 40’ x 16’ swimming pool that is edged with irregular flag-stone rocks which gracefully 'grow' into the landscaped garden. The garden has ample lounging areas. Just a few short blocks from the beach, this unique private complex is located in Old Town Key West conveniently close to shopping, art galleries and restaurants. There are two covered parking spaces, some off-street parking, and street parking is not metered. Bedding Summary: Main House - 1 queen, 2 king, 6 twins; Attached Cottage - 1 king, 2 twins; Tropical Tradition - 2 queens, 2 twins; Coco's Poolside Retreat - 1 queen, 1 queen sleeper sofa, 1 king, 2 twin beds (can be made into a King size bed). Amenities: Large 40' X 16' feet swimming pool (no heat, shared), lush landscaped tropical gardens, cable TV's, a/c, stereos in each unit, telephones, 2 washer dryer units, linens and towels provided, fenced yard, large porches, 3 fully equipped kitchens. Property is well suited to stage a family reunion, gathering of friends, or wedding party. Activities: Conveniently located to grocery shopping, art galleries, French Country and Cuban cuisine, and a bagel shop with coffee bar. Close to the beach (a short walk). 2 parks close by (one is a children's play park). Ride your bike to Duval Street and the Southern most point of the U.S. in fewer five minutes. Walk to Duval Street in 20 minutes. Activities: Conveniently located to grocery shopping, art galleries, French Country and Cuban cuisine, and deli restaurant and bakery. Close to the beach (a short walk). Ride your bike to Duval Street and the Southern most point of the U.S. in fewer five minutes. Walk to Duval Street in 20 minutes. Area: This property is ideally located in the White Street Gallery District of Old Town Key West in a historic neighborhood just a few streets from White Street and a short walk to Higgs Beach. From this location you can quickly walk to Fausto's Fine Food Palace (fine wine, cheeses, and gourmet foods), Sandy's Cafe of Cuban coffee, numerous art galleries (White Street Gallery area), and yoga and exercise studios. Close to the beach (5 minute walk). Ride your bike to Duval Street and the Southern most point of the U.S. in fewer five minutes. Walk to Duval Street in 20 minutes Duval Street shops, attractions, and the Historic Seaport District is a ten minute walk. There are three full kitchens and a kitchenette on this property. Situated in small gated pool garden compound. Our family reunion was terrific- there were 16 of us- 8 adults and 8 children ranging in age from 1-7. Our family has few chances to be all together so that part of our trip was terrific. We wanted a place where our 3 children and their spouses could be together after they put their kids to bed and this compound was great for that- plenty of beds and the buildings were close enough together that all baby monitors worked from anywhere on the property.The property itself had some problems. The description was "shabby chic"- but I would say much more shabby than chic. The small apartment attached to the main house had a wooden plank entry that was totally rotten. The main house was not well appointed when it came to kitchen tools. There was not 1 straight-edge knife in the place for carving nor were there any steak knives (none of the serrated knives available were sharp) so we ended up buying them for the house. There were signs for "house rules" everywhere- "take off all make-up before using any linens or you will be charged for any stains" (why not just buy white bleachable towels as we did when we rented our family property in New York and quit worrying? ), "if not all kitchen utensils are located in original houses you will be charged" (we just ended up using paper plates and cups to avoid any misplacement), "do not sit on any of the furniture in wet bathing suits" etc. etc. Some of the signs were understandable such as "nothing but toilet paper in the comodes as the septic system couldn't handle it" made sense as did the "no diving" sign at the pool- however the sign saying no swimming if sick or having diarrhea was just plain gross. There were no towel racks in any of the bathroom. The closet in the master bedroom was so full of stuff it was hard to hang our clothes, two chairs were chained (CHAINED?) to one of the condos (insulting- just remove them if you are worried about theft!) One toilet would not stop running and when checked we found the flapper was held together with a twist tie. We had one rainy day and water somehow came in and soaked all the bedding on one bed and destroyed a baby monitor. When pulling the bed out to remake it, we found a plug with no plug plate so all the wires were exposed. One of the buildings had been remodeled so that was very nice, but the rest of the buildings could use work! Vacation Homes of Key West was fantastic. They immediately fixed or replaced any uncorking thing when we called- They are great! For cancellations made 90 days or more prior to arrival date, the guest is entitled to a full refund less a $650.00 cancellation We do not accept guests less than 25 years of age unless accompanied by a family group or guardian.